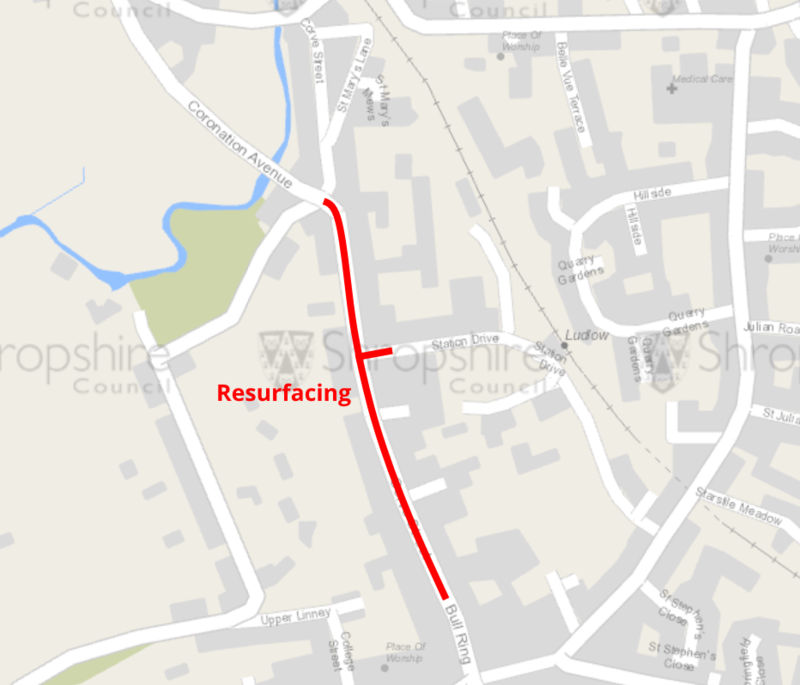 Corve Street was resurfaced by Shropshire Council’s former contractors, Ringway, in 2017. It was a very poor quality job that began to fail within weeks. It was immediately clear that the road would have be resurfaced. That work will now take place on three consecutive Sundays, 10th, 17th and 24th February. The work is timed to be least damaging to local trade, the visitor economy and buses. I am glad this work is going ahead. It will be disruptive but Corve Street will be much the better for it. The main problem with the original resurfacing by Ringway was it was the wrong specification. It was the equivalent of giving a rotting window frame a lick of paint. It was also not done well. The new surface will be high quality. The existing surface is to be milled down 50mm. A hard wearing surface will be laid. The road will have new white and yellow lines. The work will take place on Sundays to minimise disruption to trade and buses. It is scheduled for February to minimise the disruption to visitor trade. It costs more to get work done on Sundays but it was agreed this was essential given the disruption to buses that would occur with a weekday closure. This work will be weather dependent. Bad weather could mean it is rescheduled or delayed. It has taken a while to get a new resurfacing scheme organised. There has been a change to highways contractors. Keir has replaced Ringway as highways contractor. The council’s consulting engineers Mouchel became part of the Keir Group in 2015. A year so later Keir sold Mouchel to WSP, which is now the name of the council’s highways consultants. Keir will undertake this work under the direction of WSP. Last October, we agreed details and timing of the scheme. I don’t have the costs for the project or whether the council will succeed in its broader claim against Ringway for poor quality work. Diversions will be in place. Residents can expect noise from 7.30am. They will be advised on the need to move parked cars nearer the time. Residents will be allowed access to properties, though there may be times when this will not be practical. Pedestrians will be unaffected but beware of dust and fumes. We did consider marking out the parking areas into 4.6 metre bays to encourage better parking and increase capacity. Regulations for streets with pay and display discourage this because a vehicle 4.7m long, such as a delivery van, would need to purchase two tickets. Full details of the work. Great News ! Well done Andy for beavering away on this one ! Will residents be able to park in galdeford car park for free while the work is being carried out?. Disruption to all other groups has been taken into account. Would alleviate the search for somewhere else to park, and or filling up Mill street and Broad street. I was just asking a simple question and putting forward a request. At no time did I object or criticise the works being carried out. Please supply your suggestions of where to park. I hope Ringway are paying for this with additional penalties for the disruption and commercial consequences to many people and local businesses caused by their unacceptable poor quality work. Yet another example that brings into question whether the full costs and benefits of outsourcing these activities are truly understood rather than them being badly thought through, short sighted decisions driven purely by short term cost reduction. I understand that Shropshire Council has a broader claim against Ringway. I am not privy to details. When there is space, I’ll ask a question on this. Thanks, I will be interested to hear. Not so much about the specific contract but their conclusions re the cost benefits of outsourcing such services. Please be respectful and don’t throw flack at each other. I hadn’t had time to reply to H’s request. But I don’t need to persue it. The Galdeford car park is free on Sunday throughout, as is Smithfield. Castle Street is half price. Thank-you for your reply, problem solved, I wasn’t aware the car park was free on Sundays. Just one more question, would it be possible to park there on Saturday night or should it be done on Sunday morning before 7.30 am. Car parks are free after 6pm all evenings. Apologies had not wanted to upset anyone, just excited about what is a local good news story !